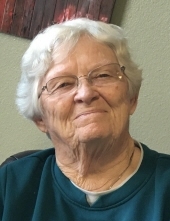 Ardith Campbell Roush, 87, of Cut Bank, lost her fight against Alzheimer’s disease, February 1, 2019, where she was surrounded in love by her family. Ardith was born in Lewistown, Montana on May 26, 1931 to Jack and Monta Campbell. She was preceded in death by both parents and her brother, John. She was raised in Lewistown, Greenfield, and Gildford. She married Glenn Roush on April 24, 1958 and together they raised their family and were residents of Cut Bank, Montana for 60 years. Ardith was a lifelong member of St. Paul Lutheran Church where she served on the Women’s Auxiliary. She volunteered weekly for 30 years at the Glacier County Medical Center as a Pink Lady. She also served as a Glacier County Election Judge. She especially loved being outside working in her rock and flower gardens raising beautiful flowers, especially her prized four o’clocks. Ardith and her husband loved traveling the state and especially camping at Holland Lake. The yearly family reunions were the highlight of the summer. Ardith is survived by her husband of 60 years, Glenn Roush; daughters Kay Neil (Jake) and Glenda Armstrong (Brian); sons Ryan Roush (Robin) and Neal Roush; grandchildren Stephanie Gaertig (Joel), Travis Neil, Renae Hubbard (Tyler), Kaylie Hanson (Shawn), Todd Roush, Anyssa Roush, Madison Armstrong, and Sydne Armstrong; great-grandchildren Jack and Gavin Geartig, Ellie Hubbard, and Ryker Hanson. Above all else, Ardith loved spending time with her children, grandchildren, other family members and friends. Her sense of humor and wonderful laugh will be missed by all that knew her. In lieu of flowers, memorial contributions may be made to the Alzheimer’s Association, Montana Chapter, 3010 11th Ave. N, Billings, MT 59101 or the donor’s choice. To plant a tree in memory of Ardith Campbell Roush, please visit our Tribute Store. "Email Address" would like to share the life celebration of Ardith Campbell Roush. Click on the "link" to go to share a favorite memory or leave a condolence message for the family.